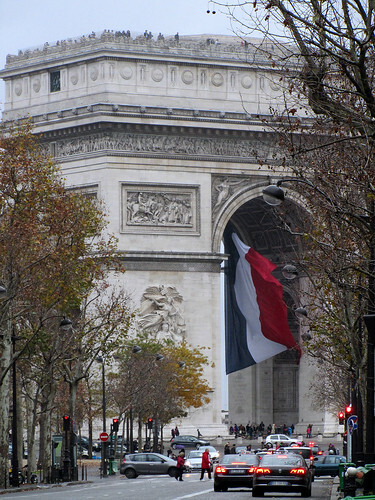 I have absolutely no idea where there is a giant flag hanging off the Arc de Triomphe. It wasn’t there the day after Armistice Day, and I’m not sure if there has been any date of significance in the French (civil) calendar between then and now. Oh well, in any case, the flag is there today. And have you spot the visitors looking down from the top of the arch? It is a pretty cool viewing point, especially in the evening. On the home front, I’m finally all unpacked except for my books. It is a bit of a problem, that. I am not sure where I can stash them, and this apartment doesn’t actually come with any bookshelf. I could get one, but it still needs someplace for me to set it up to start with. I guess I’ll just have to read the books I have quickly and then set them free to other new loving homes. Have you checked my latest progress on this year’s big read? I’m getting closer and closer to the target of 100! 100 books in a year…great achievement lil!! !